Louise has worked in business development for the SDL Group for eight years where she has secured and developed multiple corporate partnerships and new revenue streams across the Group. 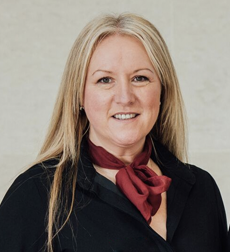 Currently Louise is championing the SDL Auction Partners division helping estate agents across the UK to offer auctions to their vendors while also offering greater security and fees. What is the best quality of SDL Auctions, and how is it different to other auction businesses? For me it’s about solving problems and giving our customers a great experience; we will do everything we can to get the best outcome for them by selling at auction. Importantly if it’s not right for them then we will tell them that too. We really care about our customers, our partners and the people who work in our business. What is office life like for you and your team? Lots of banter! Or ‘bants’ as my youngest son would tell me. We take what we all do seriously and it can be tense and pressurising at times so we encourage everyone to be able to have a laugh and inject a sense of humour when it’s a tricky negotiation. I often say “even God didn’t convert everyone” so if something doesn’t go your way just move on. We’re not here to be pushy sales people but educate people and show them there is another way available to them in selling their property through auction. But it’s not suitable for everyone and that’s okay. At least we have shared what we do and they can make a choice based on our advice. What is your approach to work / life balance? I am a single mum with three children from 11 to 16 so I have to have a balance or I would burn out quickly. The truth is it is really hard sometimes and I am on the edge of falling off at times! SDL has always been supportive and know the home version of me is as important as the work version. I feel like I never give enough time to my kids but then I know they gain a lot by having a career mum who inspires them to work hard to achieve their goals as we all benefit from that. The odd time they have come in with me to hang out in our social spaces at work they love it. My son did work experience with us last year and I think he got a whole new appreciation of what ‘mum at work’ looks like. When we won the EA Masters they were as proud as I was. It’s times like that where the odd late dinner and distracted mum pales into insignificance! What is your approach to making contacts which are useful for the business? It’s all about being open and sharing information that we could all benefit from. I make introductions wherever I can as it’s often a case of ‘I don’t know but I know someone who does’. I am a great believer in being authentic as I think people can see fake at a hundred paces so I am just myself and think about how our relationships are two-way where everyone wins. It’s all about reciprocity. Who has inspired you most in your business life, and why? I joined SDL Group in 2010 to work for Rob Clifford (commercial director) and between him and Paul Gratton (CEO) they unleashed me to trust my business acumen and the ability to build great relationships. Rob famously said once “I was unencumbered with prior knowledge of the topic” which I took as a green light to share my thoughts even if I was new to the business! In a business development discipline it’s always the most recent win or new contract. But simply for me it is that I still always do what’s right for our business, our customers and our people. I still learn something every day. Recognition of my impact on our business mostly, but also to be a great female leader in a progressive business. If you hadn’t been Business Development Director, what would you do instead? Probably a singer or run a business of my own. What time of day are you at your best, and why? I am not an early bird so I use the morning to get quieter stuff done and I am more creative in the afternoon. I find it really hard to switch off at night so I end up staying up way past my bedtime! Do you use Facebook, Twitter or other social media? I have dabbled at Twitter but really Facebook and LinkedIn are my social media vices. I use them both for business but am more selective with business Facebook friends as you would expect. Often when you spend time with clients and business relationships they become friends. If you could have a coffee with anyone, who would it be, and what would be your choice? I would like to have a coffee with myself some years back to let myself know it would all be okay. Spending time with my kids, enjoying the great outdoors, singing, eating and drinking with people I love and like a lot.